Where can I buy Wartner Wart Pen? 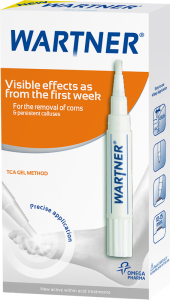 The Corn Pen contains TCA gel, which is less concentrated compared to the Wartner Wart Pen. As corns & persistent calluses have a different cause, a specific treatment is therefore needed. TCA creates an ongoing peeling effect resulting in a fast removal of corns and persistent calluses. Carefully apply the dispensed gel only on the corn or callus (avoid touching healthy skin surrounding it). Forming a drop may require several full turns when used for the first time.